It's the time of the year again when Rosa Danica is adding new varieties to their pot rose assortment. While this in itself isn't that remarkable, they did add three new reds - a difficult color in breeding. And with Valentine's Day around the corner, Torben Moth Madsen is happy with some extra reds. "They are doing great." 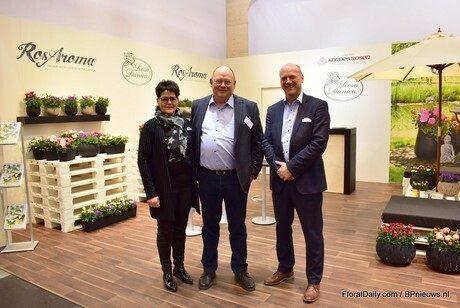 For many years, this Danish grower is cooperating with German rose breeder Kordes Roses. They are working together closely in search of the best varieties. "They breed and we trial the new varieties, not only on how they grow, but also on how they sell." So far, they have put on the market several pot roses in the line named Kordana, scented pot roses in the line RosAroma and the single rose in a pot; 1Rose. The three new red pot roses are added to the Kordana line. But why three new reds? "Red is an important color for roses - also pot roses - but is difficult to breed. It is therefore always nice to have some extra reds in our assortment." And even though they are all red, they are well distinguishable. "Brave Kordana, for example, has a more normal flower type, Sioux Kordana has more a garden type flower and the outside flower petals of Red Rebell Kordana are white." Now, Madsen is curious about the reactions out of the market on the long term. "During the trial phase, we've already tested the demand and the reactions were very positive. Now, we will see how the demand will be on the longer term. Then, we will only keep the best performing ones. And even then, they will continue breeding and find new red varieties. We will never say that we found the best variety. It can always be done better." Every year, during this time of the year, Rosa Danica introduces their new varieties and the fact that it is just before Valentine's Day is not planned. "It is a convenient coincidence - particularly when introducing a red variety." According to Madsen, the demand for all the new red varieties is very good. 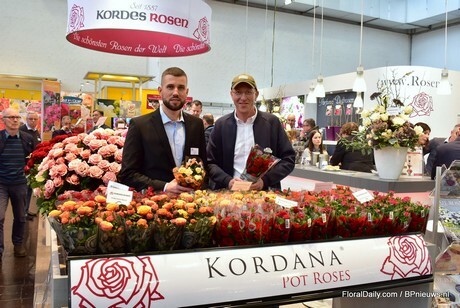 Wilhelm-Alexander Kordes of Kordes Roses and Gert Jensen of Rosa Danica presenting the new Kordana pot roses in the booth of Kordes Roses at the IPM Essen 2019. Next to the red, Rosa Danica added three more varieties; the yellow pink / red edged Airbrush Kordana Classic, the orange Phoenix Kordana Grande and the yellow / orange Maracuja Kordana Grande. Another new variety of Kordes Roses that is currently being grown by Dutch rose grower Leo van der Hargh is the yellow/orange/pink Firebird Kordana Grande. This variety was also trialed at Rosa Danica and according to Madsen, this variety is already in good demand for International Women's Day in Russia, which is celebrated on March 8.